Dubai, UAE, April 16, 2018: Finding stylish and functional accessories for your little one shouldn't be a chore, and with Aussie-owned Penny Scallan Design now available in the Middle East, the task has been made so much easier for parents and gift givers alike! 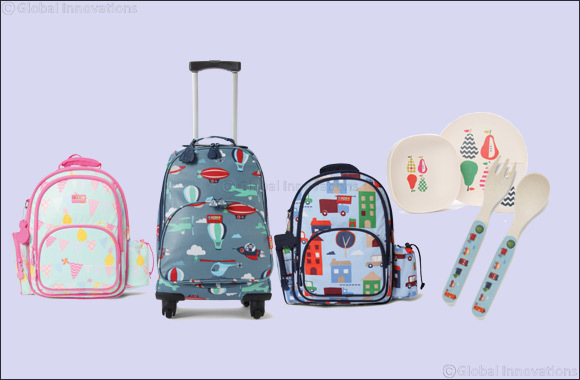 With a beautiful range of the loveliest lunchboxes, roomiest backpacks, the most eco-friendly mealtime sets and much more, Penny Scallan Design is your one-stop-shop for children's lifestyle pieces. From babyhood through to the school years, Penny Scallan Design's products withstand all of the rigours of a child's day and are an essential part of every family's life. The Penny Scallan Design story began more than 12 years ago as a one-woman operation selling nappy bags, bibs and backpacks from a spare room in a tiny suburban home. Since then the brand has become a global success story, known and trusted in countries such as China, Korea, France and Poland, with the exciting addition of the UAE this month. A focus on style and functionality ensures Penny Scallan Design stands head and shoulders above the rest with an array of bright and unique quality pieces that allow your child's personality to shine through. With a range of six adorable Australian designed prints including Chirpy Bird, Big City, Pear Salad, Space Monkey, Pineapple Bunting and Navy Star depicted on charming backpacks, lunchboxes and homeware, Penny Scallan Design sets the bar exceptionally high for all things for the little ones. Let your little one stand out from the crowd with a Penny Scallan Design Bag. Made from the highest quality materials, each bag features bold, beautiful and original designs to suit any personality. From luggage, backpacks, sports and dance bags to shoulder bags, overnight bags and more, each bag is stylish yet functional. The Classic Collection is made from 100% coated cotton canvas, which is water resistant and easy to wipe clean. The BARE Collection of bags features a soft, uncoated and resilient, lightweight fabric and is a fantastic alternative to the classic water resistant coated canvas range. It is especially good for little people to carry. Penny Scallan Design lunchboxes and snack bags ensure food stays fresh, crisp and tasty until your children are ready to eat. They have lunchboxes that can be worn like a backpack, regular zipped boxes and hot/cold packs to maintain the temperature of the contents. You can eat, drink and be merry with the delightful Meal Time range from Penny Scallan Design. From stainless steel drink bottles and bamboo cutlery to tumblers and comfy cotton bibs, mealtime sets are biodegradable, eco-friendly, dishwasher safe and designed for everyday use. Cute and colourful placemats and hot and cold packs complete your set. Whether you are looking to update your child's school bag and lunchbox, or even gift a little loved one, each Penny Scallan Design piece is practical, useful and incredibly cute. Penny Scallan Design is currently available from Virgin Megastore, John Lewis at Robinsons, Bumble Bee (Dubai Mall, Tyrano at Abu Dhabi and Level Kids City walk Dubai), Little Luxuries, FivelittleDucks and Mennez in Oman and Mumzworld.com with prices starting at AED 29.73. Penny Scallan Design – where one piece is never enough!